In an interview on ESPN Radio Friday, St. Louis Rams GM Billy Devaney said he’d be surprised if they stayed at pick 33 before round two begins tonight at 6pm. With reports that the Bills and Browns have been in contact with the Rams, you’ve got to believe there are other teams looking to move to the top of the board on day two as well. The Rams apparently feel with all the offers they’re getting they’ll soon be getting an offer they can’t refuse. There’s a lot of speculation on what the Bills might be targeting, but if they do in fact get up to 33 I see Buffalo targeting a left tackle. The top three prospects left on the board at that position at this point are Rodger Saffold, Charles Brown and Bruce Campbell. Maryland OT Bruce Campbell already put up some good numbers just weighing in as he was 315 pounds at 6’6 1/4″ with 36-inch arms. He also put 34 reps up on the bench press. After his 40 time here at the combine Saturday he’s officially a workout fiend. Campbell thus far has put up the best 40 time among offensive linemen at an unofficial 4.78. He’s forecast as a late first-round pick as he’s considered a better pass protector than run blocker, though he did improve his run blocking last season. Winner of the Adonis award thus far at the Combine is Maryland OT Bruce Campbell. The guy is put together. 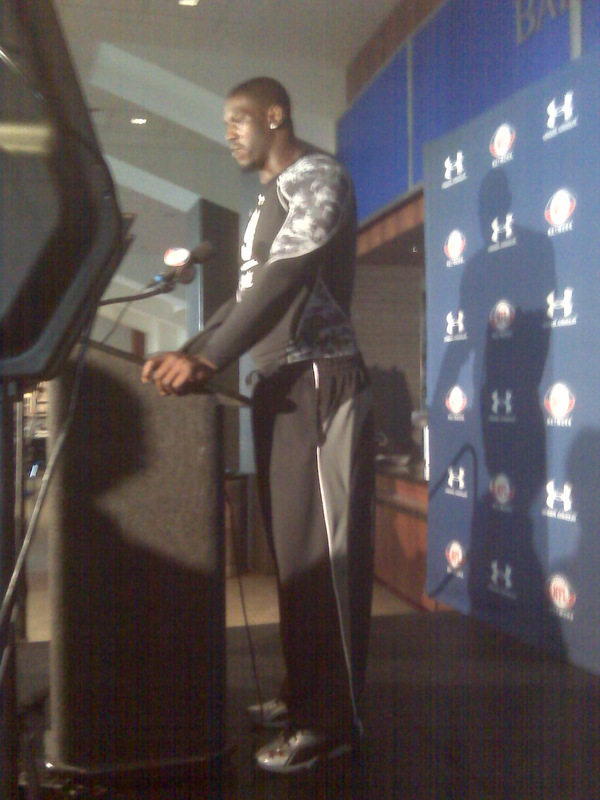 Campbell said he measured today at 6’6 1/2″ 315 with 10 1/2 inch hands and gargantuan 36 1/2 inch arms. The photo below was the best I could do, but doesn’t do the man justice. He was chiseled, which is hard to accomplish at that height. Campbell is forecast to be a late first-round pick, with pass protection being his best asset. Still working on the run blocking.